An enthusiastic crowd of United Methodist Men gathered at The Wesley Center Jan. 30-31 for fellowship, meaningful worship and to learn more about how Christians can help to stop domestic violence. Gil Hanke, general secretary for the General Commission on United Methodist Men, used “Men Ending Domestic Violence” as the focus of his presentation to the participants. 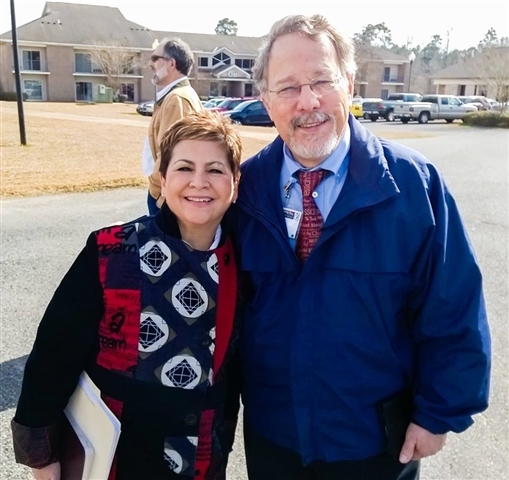 Hanke is pictured with Bishop Cynthia Fierro Harvey, who led worship during the two-day event. Bishop James Swanson, resident bishop of the Misssissippi Area and president of the General Commission on UMM, served as keynote speaker for the conference which also included opportunities for local UMM officer training and breakout sessions on subjects such as Disciple Bible Outreach Ministries.